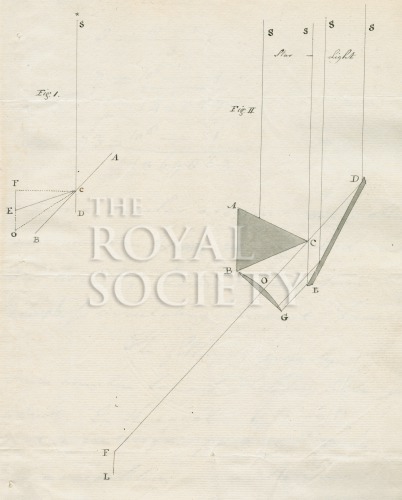 Figures 1-2 from the paper “A proposal for detecting, by observation, any great concealed motion which may belong in common to all the bodies of the Solar System, and for ascertaining the velocity of that motion...by Patrick Wilson in a letter from Nevil Maskelyne. Not published in Philosophical Transactions of the Royal Society. Maskelyne wrote to the Royal Society in an attempt to establish precedent for Wilson in the face of a similar prism-based method expressed in a paper by Robert Blain. Inscribed in ink with the figure numbers. Not signed.